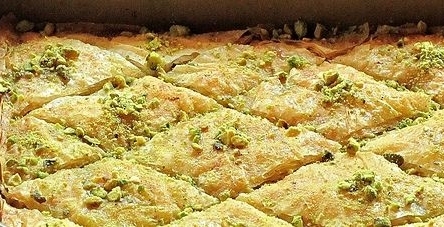 Baghlava is an Iranian food recipe of sweet baklava. In a mixing bowl, combine almonds with 6 tbsp of the sugar and ½ tsp of the cardamom. In a second bowl, combine pistachios with remaining sugar and cardamom. Set aside. Brush an 11 by 7 inch baking dish with melted butter. Place one layer of phyllo dough in dish and use a pastry brush to brush dough with butter. Add another layer, also brushing this one with butter. Spread the almond mixture in an even layer over pastry. Add another sheet of phyllo and brush it with butter. Add the pistachios in a layer over the dough. Add the last two sheets of phyllo, buttering each one before you place it on top of the pistachio mixture. Use a fork to prick small holes in the baghlava’s surface. Place in oven and bake 20 to 30 minutes, or until golden brown. While baghlava is baking, prepare syrup. Place sugar and water in a saucepan over high heat and bring to a boil. Reduce heat slightly and boil gently for 15 minutes. Remove promptly from heat and stir in rose water. 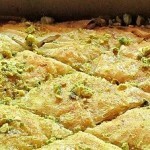 Remove baghlava from oven. Use a sharp knife to cut it into small diamond-shaped pieces. Pour syrup over all and sprinkle with pistachios.